/ Will Angels Preach the Gospel Worldwide Before the End? Who these gospel-preaching-men might be in this case is perhaps answered by the immediate context. The three angels are introduced right after the 144,000 are described on Mt. Zion along with their special sealing of protection. The angels will deliver the messages to men like the 144,000, as well as other prophets before them, specifically Elijah. This for me explains the reason for the special protection on the 144,000: they have work to do in a hostile environment: proclaim the gospel to the whole world while it is under nearly complete control of the Antichrist. The logical choice for who will deliver this message "before the end" is the one named end time prophet: the end time Elijah prophet of Malachi 4:6. "Turning people to repentance" as it says is what the good news of the kingdom message does. It would make sense for Elijah to start this message using the Internet and then pass the baton to the 144000 when it goes down with WWIII and Wormwood (which by no coincidence is when the 144,000 are sealed). This underlines the fact once again that God is not trying to save everyone now. He is calling his firstfruits who have the tenacity to choose his way repeatedly against the opposition of Satan and his minions, the world, and their own nature. According to the Bible, their reward is to reign as kings and priests for 1000 years on earth before the Great Harvest "of the rest of the dead" is bought in. The good news of the kingdom is a life-changing secret today, that will be unleashed on the world later (Mt 24:14). If you wish to understand it now in depth and along with the incredible offer of help that God is literally making to all believers, please consider reading my exhaustive supporter study on good news of the kingdom. If the end will come when the gospel has been preached throughout the world, then if we know the stage of this program we would have some indication of the nearness of the end, Christ’s return to earth and to bring about His rule. What is your view on what stage we are at in this endeavor? Are there any nations which have not been reached by this message yet? Ernie, see my new article that explains this question. It’s not about countries that the Christian gospel reaches. It’s about the Gospel of Jesus, the Good News of the Kingdom returning. Tim, God will attempt to preach in the end to save many but Jesus will turn people away saying I never knew you? Can you shed some light on this? Kescher, despite God’s powerful, great end time revival through Eljiah teaching repentance and the Good News of the Kingdom, not everyone will listen, not even most Christians. Christians who go along following religion instead of the Word of God, even when they do it in Jesus’ name, they must be rejected. The vast majority of believers have been duped by very questionable Bible translations which largely misrepresent Yehovah’s plan of salvation. They even believe that they will “retire” in “heaven”. And many such heresies. To be sure, Jesus Christ, our Savior informed the man crucified next to Him that His place of abode is in PARADISE–not some nebulous place in “heaven”. Here’s another heresy: There is 110 times the word “ekklessia” written in the Greek New Testament (Original Greek New Testament text inspired by the Holy Spirit). and not a single word for “church” exists in place (or to replace) those 110 words that Holy Spirit inspired there! Imagine that! There are reprehensible and lazy persons going out there to the pulpits of Christianity and (without doing a single hour of STUDY and research) continue to talk about “churches” and “heaven” and “baptism” (the original Greek word “baptizio” was left untranslated by Tyndale!). To be sure, the Greek word “baptizio” meant “to immerse someone deep in water”–not to “sprinkle with water”. And…some 20,000 more heresies like the foregoing…. Thanks God for Tim McHyde, for his careful attention that He gives to the Words of God inspired in the Bible! We can learn something from him all the time he pens down his research information from the Bible. It seems pretty obvious to me that the ‘angel’ is a satellite broadcasting an everlasting gospel message all round the world. In those days what word would the people use name such an object flying round in the sky ? An angel seems the obvious word for those times. evie as far as I can tell, satellites are definitely different from angels. Another problem with your idea is how do the angel messages get out in this case after Russia and China nuke Mystery Babylon aka USA turning it into a nuclear wasteland and Wormwood eradicates civilisation until the Beast establishes his kingdom? Don’t feel bad the Bible isn’t an easy book to read let alone understand the plain meaning of verses. I had that experience as well with the Bible too. I used to be married to a youth pastor and I still keep in contact with a lot of the youth I ministered to. I wanted to let you know that I have been seeing an increase in interest in what the Bible actually says vs. what the church has taught. Those who are brave enough to speak out have gotten some backlash from the older generation and their family. I have been quietly referring them to your site and seeing if the seed grows! Thanks for all you do – it is making a difference. I noticed in the news NASA has discovered a planet out there drifting through space with a magnetic field 200 times stronger than Jupiter and it is only 20 lightyears out. Could this be Wormwood? Steve, I’ll have to write an article about this Friday, stay tuned =). I doubt it as this rogue planet is a super Jupiter yet Wormwood is smaller than the Earth as it is a dwarf planet. A super Jupiter would tear the Earth apart while a dwarf planet would be pulled apart by the Earth’s gravity to rain down on the surface. Also shouldn’t Elijah be warning people about it if this was Wormwood? All valid points. The story of this planet just goes to show how little NASA does know about what is out there and how something could sneak up on us. I still like Katrina’s insight that it will just appear because it will come from God’s dimension. Indeed there is a lot of things that NASA is unaware of. Remember that asteroid that came closer than the Moon orbits Earth? Yes Wormwood is in Heaven right now waiting to be unleashed on the world when the 144,000 are sealed in the safe zone. 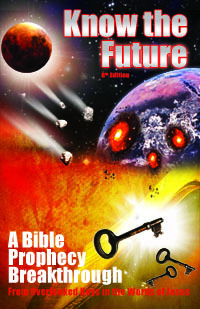 What happened to Sodom and Gomorrah foreshadow what will happen in the last 7 years of the age. So basically we’re looking for the following events to confirm the end: building of the Third Temple (which could take a few months to construct), the destruction of Damascus which is the thermal nuclear war mentioned in Zechariah and the Preaching of the Gospel to the nations (which is very subjective and only God would really know when the preaching is finished to His satisfaction). Mauricio, no, the Third Temple is not a sign of the end as it’s unclear when it is built. Same with the Damascus war, it can come any number of years before the end does. The global publication of Good News of the Kingdom is the one sign we have that the end is ready to come (Mt 24:14). It clearly says the angel the “having” the gospel in verse 6, is “saying” the gospel in verse 7. God has no precedent to go by…He is God. Sean, it’s funny how every time a Christian insists something is “clear” in the Bible, it’s anything but clear. Verse 7 does not state he shares good news and contains no good news of any kind whatsoever. It’s a warning about bad news that God’s judgment is coming. This fits the past precedents that God uses only men to preach to humanity, not angels.